Upgrading to Compete is a copublication of the David Rockefeller Center for Latin American Studies and the Inter-American Development Bank. Can local markets and clusters represent a powerful alternative to global markets? Do transnational corporations and global buyers play a role and enhance or undermine local firms’ upgrading and learning? 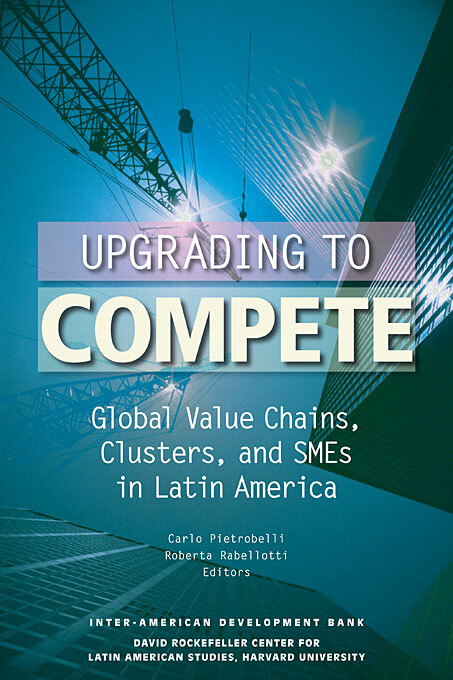 What opportunities do clustering and global value chains offer to SMEs in global markets? Upgrading to Compete shows that both the local and the global dimensions matter at once. Clustering and collaborating with other local firms offers substantial advantages, and participating in global value chains and interacting with foreign buyers and companies may enhance local firms’ capabilities and access to distant markets as well. However, what matters most markedly is the form of governance of value chains and clusters, which affects the upgrading process of local SMEs. Thus, hierarchical and less cooperative chains often inhibit more complex and promising forms of upgrading. 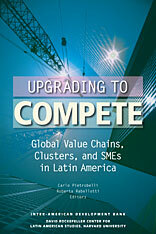 The book illustrates this point with original empirical evidence from several clusters in Latin America. Case studies from Brazil, Chile, Mexico, and Nicaragua are supplemented by desk studies on other experiences in the region. The methodological foundations and the policy implications of these analyses are also exhaustively addressed.